In Nepal, over two million people are exposed to excessive natural arsenic (10–1500 ppb) in groundwater. The majority of these people live in the agricultural Terai region, on the edge of Ganges floodplain at the base of the Himalayan foothills. The remainder are exposed via deep wells in the Kathmandu Valley in a primarily urban setting. Tube wells down to 50 m in the Terai commonly exhibit cyclical, temporally correlated variation in dissolved arsenic, iron, and other species. In Nawalparasi, the most arsenic-affected district, these wells tap thin (2 m) gray sand aquifers embedded in a thick (>50 m) sequence of organic clays. Monsoon recharge refreshes these aquifers, temporarily minimizing dissolved arsenic concentrations. 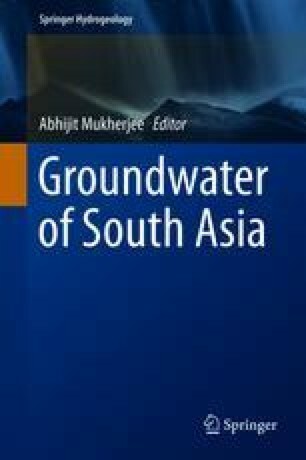 Post-monsoon, average groundwater compositions exhibit increasing water–rock interaction with time (increasing TDS and cation exchange, forming increasingly Na-HCO– waters) and increasing dissolved arsenic and iron. Collectively these observations strongly support a model of reductive mobilization of arsenic from adjacent clays into aquifers in the Terai, tempered by repeated flushing during periods of heavy precipitation. In Kathmandu Valley, moderately elevated arsenic (up to 150 ppb) may be leached from overlying silts and clays, but concentrations remain constant throughout the year. In the Terai, effective mitigation is challenging, depending primarily on well-switching (marking contaminated wells) and installation of household point-of-use filters. Mitigation in the urban setting will emphasize blending with clean surface water from mountain reservoirs. The original research summarized in this review was supported by NSF Grant INT-0331798 (Brikowski) and Fulbright Senior Scientist (Smith) and Fulbright Visiting Scientist (Shrestha) grants. Field support provided by Filters for Families INGO, Kathmandu, Nepal. Travel supported by Geological Society of America Student Research Grant (Neku), drilling supported by WaterAid Nepal, chemical analysis supported by UNICEF/DWSS. Tracer tests supported by UNDP SGP Grant (Smith). UTD Geosciences Contribution #1308.